May felt like the month when Dylan’s centenary celebrations reached a high watermark as the poet’s words flooded across our radios and TVs (in Wales at least) as the BBC presented us with their Dylan Thomas season. The season featured an impressive range of programmes headed by the flagship Andrew Davies drama A Poet In New York starring Tom Hollander, and the innovative all-star version of Under Milk Wood. Other television highlights included the excellent A Poet’s Guide to Dylan Thomas presented by Owen Sheers, a good biography from the Welsh Greats series, two Thomas themed editions of Weatherman Walking, and a 3-part documentary A Poet On The Estate following Benjamin Zephaniah’s attempts to inspire the residents of Swansea’s Townhill estate using Dylan’s words. Radio highlights included a Dylan Thomas Day on Radio 3, a live concert from Cardiff’s Hoddinott Hall, and the premiere of the first production of Dylan’s script The Beach of Falesa starring Matthew Rhys. The season was well supported on-line with the BBC making a good deal of archive and educational material available. BBC Radio also had a strong presence at the first of the Dylan Thomas themed Laugharne Weekends where they broadcast live from the grounds of Laugharne Castle throughout the weekend. Sir Peter Blake’s Llareggub exhibition featuring his illustrations for Under Milk Wood opened at Oriel y Parc, St Davids on May 17th and runs until September 23rd. A series of special events take place during the exhibition including a display of film memorabilia from the 1972 big-screen version of Under Milk Wood that was filmed in Lower Fishguard. Dylan’s poetry notebooks, on loan from the University at Buffalo in the US, finally made their first public appearance in Wales when the exhibition at Swansea’s Dylan Thomas Centre opened on May 31st. They will be on show in Swansea until August 31st after which they transfer to the National Library of Wales at Aberystwyth. 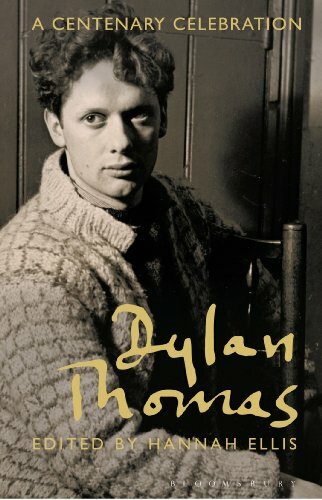 May also saw the launch of Literature Wales’ Dylan Odyssey series of literary tours when a canoeing trip crossed the Taf estuary at Laugharne in the company of Thomas experts Jeff Towns and John Goodby. There are more of these innovative tours planned throughout the centenary year. For more information on events during June and beyond please check out our comprehensive Events page. Laugharne hosted the first of three Dylan Thomas inspired weekend festivals with a poetry & theatre themed weekend from May 2nd-5th. The weekend saw the premiere of Raw Material : Llareggub Revisited by Jon Tregenna and Marc Rees, the site specific modern day take on Under Milk Wood staged by the National Theatre of Wales. Dylan inspired events took place all over the town including the grounds of the castle where the BBC set up a studio and marquee for recording and broadcasting a number of programmes including a Dylan Thomas Pub Quiz, Thomas themed editions of Radio 3’s The Essay (still available to listen), and interviews with the great and good including actress Siân Phillips and artist Sir Peter Blake. 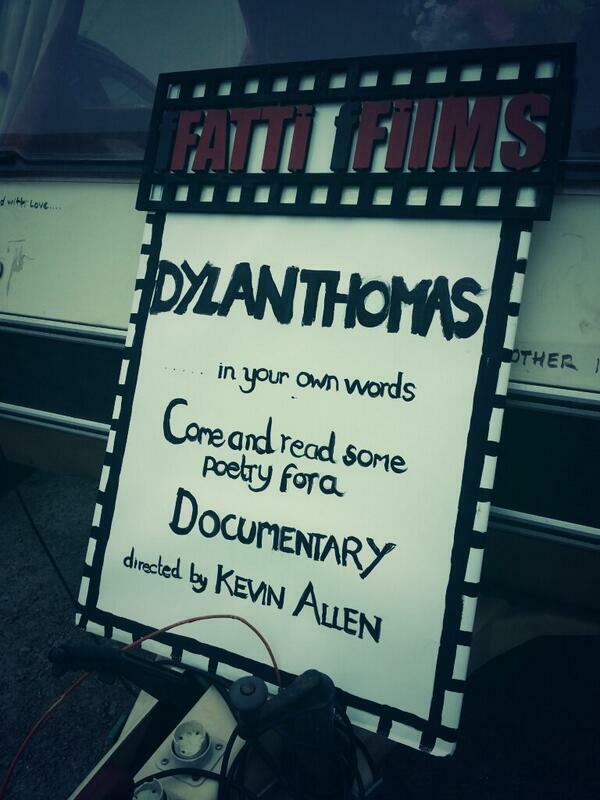 Jeff Towns’ book shop on wheels Dylans Bookstore was a popular hub for visitors and performers alike, and in a neighbouring caravan, film director Kevin Allen was recording people reading the words of Dylan Thomas for his forthcoming S4C documentary on Dylan fronted by Rhys Ifans. Dylan was also celebrated at this year’s Hay Festival with a series of events culminating in a reading of some of his poems and prose by a star-studded line-up. 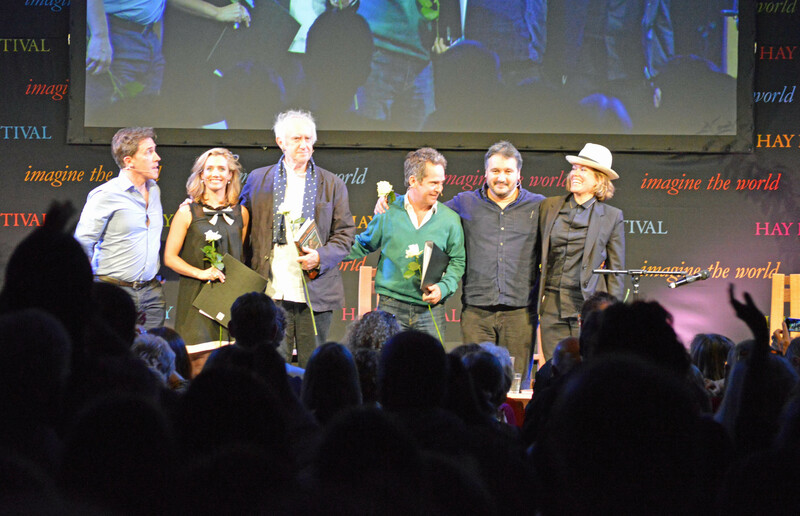 Rob Brydon, Lisa Dwan, Jonathan Pryce, Tom Hollander, and Cerys Matthews read from Dylan’s works introduced by festival director Peter Florence. Cerys Matthews also performed her new musical version of the Reverend Eli Jenkin’s prayer from Under Milk Wood. Other events included Owen Sheers delivering the 2014 Raymond Williams lecture on the subject of the poetry of Dylan Thomas, and Tom Hollander and Andrew Davies discussing the making of the BBC drama A Poet In New York. 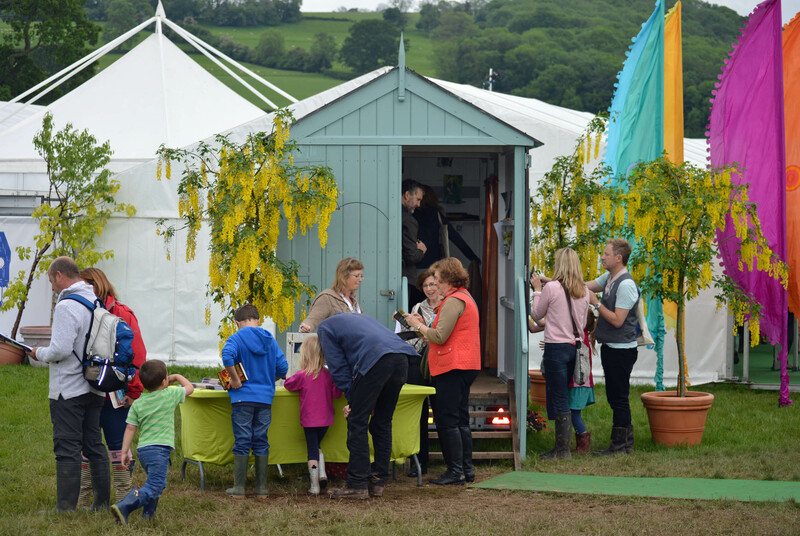 The replica of Dylan’s writing shed was present for the whole festival where visitors were encouraged to contribute new words to the Dictionary for Dylan, and visitors to the Visit Wales stand could be recorded reciting lines from a Dylan Thomas poem as well as picking up free Dylan Thomas merchandise. The bus shelter outside the festival site was decorated with words from Under Milk Wood, and students from Hereford College of Arts also used Under Milk Wood as their inspiration for decorating some of the festival’s canvas walls. Dylan’s work is soon to be available to a huge new potential audience as some of his poems are to be translated into Mandarin Chinese. 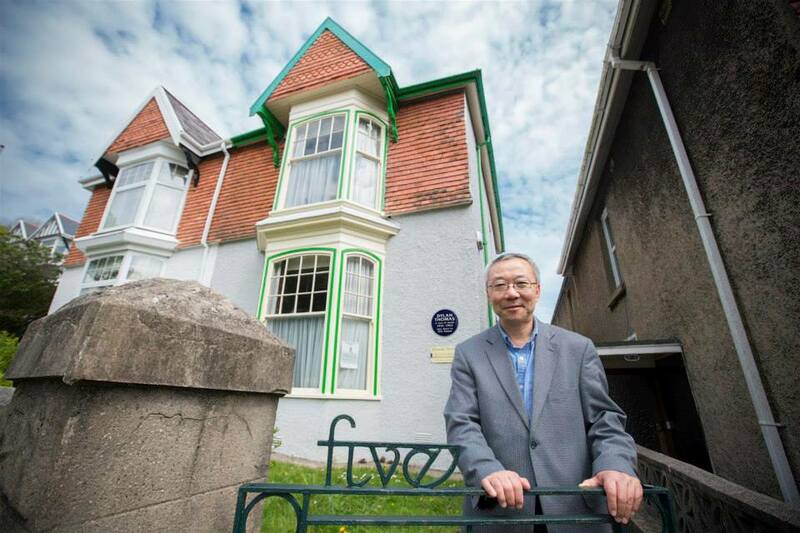 Translation expert Professor Wu Fu Sheng visited Swansea recently to work on the translations and made a visit to Dylan’s birthplace at 5 Cwmdonkin Drive. The UK launch of the 2014 Dylan Thomas Prize took place in London on April 29th at an event hosted by the Secretary of State for Wales the Rt Hon David Jones MP. The prize, sponsored by Swansea University, which is usually awarded to a writer under 30, has been specially extended this year to include writers up to the age of 39. This is to mark the Dylan Thomas centenary, Dylan died at the age of 39 in 1953. A major event has been announced to mark Dylan’s 100th birthday on October 27th. 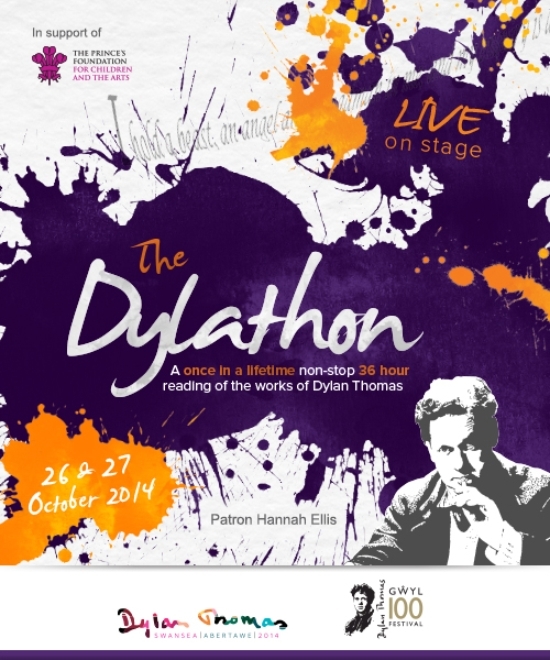 The Dylathon, a 36-hour non-stop all-star reading of works by Dylan Thomas will take place at the Swansea Grand Theatre on October 26th & 27th. The event, staged and devised by Michael Bogdanov will feature readings of Dylan’s poems, short stories, letters, broadcasts, film scripts and Under Milk Wood. The full line-up is yet to be announced but is expected to include Matthew Rhys, Michael Sheen, Rob Brydon, Greta Scacchi, Siân Phillips, Celyn Jones, Kevin Eldon, Ruth Madoc, Ruth Jones, and many more including choirs, bands, and community groups. 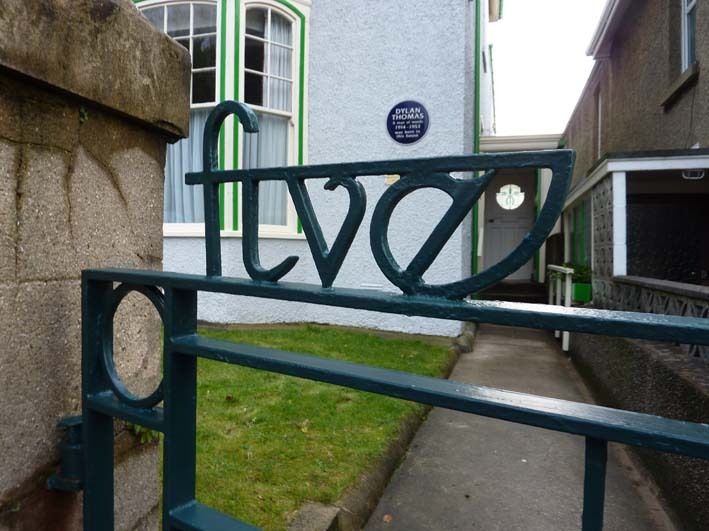 Former US President Jimmy Carter has agreed to be the Honorary Patron of the centenary celebrations at the Birthplace and has recorded a video to launch a new audio-visual tour for visitors to 5 Cwmdonkin Drive. President Carter is a long time fan of Dylan’s work and was instrumental in securing a memorial to the poet in Westminster Abbey. A new schedule for guided house tours has also been launched at 5 Cwmdonkin Drive, and the Birthplace now has it’s first Versifier in Residence, Natalie Ann Holborow. The Birthplace has launched it’s 100 voices for 100 years of Dylan Thomas project with an interview with comedian and presenter Griff Rhys Jones. The project aims to create an archive of sound and video interviews with people who have known Dylan or have been inspired by him. The long search for moving footage of Dylan may be over as Chairman of the Dylan Thomas Society Jeff Towns has identified Dylan taking part as a film extra in a movie being shot on Pendine Sands, Carmarthenshire in 1951. Pandora and the Flying Dutchman starring Ava Gardner and James Mason, and directed by Albert Lewin, was set in Spain but included a sequence filmed at Pendine. An interview in the Colin Edwards archive recorded that Dylan had taken part in the filming as an extra and a photograph of Dylan on set was reproduced in the book Dylan Remembered Volume Two that showed how he was dressed on the day. A segment on the BBCs The One Show showed how Jeff had identified one of the men in the background as Dylan. 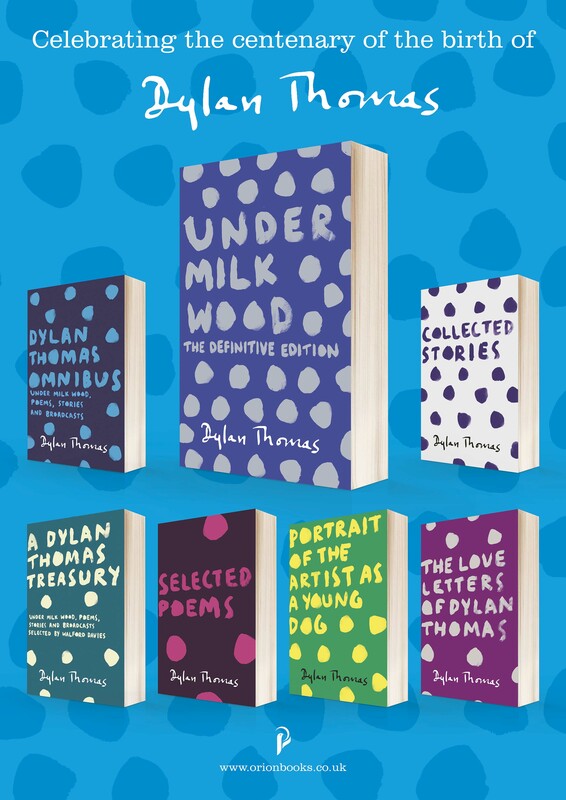 New cover designs for a number of the Dylan Thomas titles currently in print have been issued following a competition for students launched by publishers Weidenfeld & Nicolson. The winning designs by Zigmunds Lapsa, a student at the Royal College of Art, were inspired by Dylan’s polka dot bow tie. 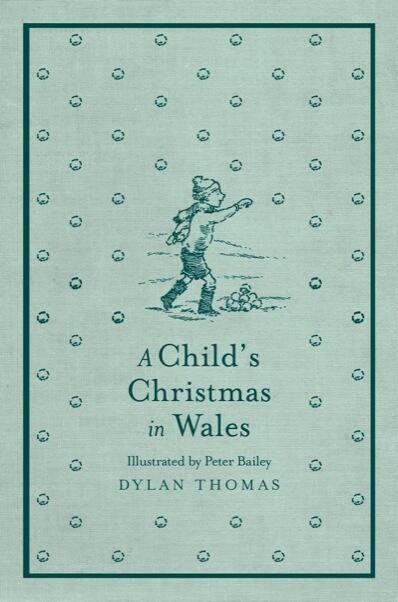 A new edition of A Child’s Christmas In Wales is due from Orion in October with full-colour artwork by illustrator Peter Bailey. Dylan Thomas: A Centenary Celebration is published in September. A collection of specially commissioned essays celebrating the poet’s life and work, and exploring his lasting legacy. Edited by his granddaughter, Hannah Ellis. Includes contributions from David Thomas, Clive Woosnam, Gillian Clarke, Owen Sheers, Cerys Matthews, Jimmy Carter, Phillip Pullman, and Michael Sheen. With a foreword by Monty Python member Terry Jones. A new big screen depiction of Dylan Thomas has been announced as Rhys Ifans is set to play the poet during his last days in New York in Dominion. The film which will co-star John Malkovich as John Malcolm Brinnin will be shot in black & white and will be directed by Steven Bernstein. It is also reported that a bartender at the White Horse Tavern will play a pivotal role in the film as he communicates with Thomas throughout the movie. The other forthcoming big screen depiction of Dylan, Set Fire To The Stars, starring Celyn Jones and Elijah Wood, has it’s world premiere at the Edinburgh Film Festival in June and has been nominated for a Michael Powell award. The film will have a soundtrack composed by Gruff Rhys. Location filming is set to begin in Solva, Pembrokeshire for Under Milk Wood directed by Kevin Allen. The film which will be partially funded by S4C will be produced in English and Welsh language versions using the same cast led by Rhys Ifans as First Voice. The film version of Return Journey starring Bob Kingdom as Dylan, directed by Sir Anthony Hopkins, will be re-released on DVD in July. Dylan Watch on TV & Radio – With the BBC’s Dylan Thomas season taking place (see above) there was of course a great deal of Dylan Thomas on TV and radio this month. Some of the other occasions when he cropped up include Tom Hollander appearing on a number of TV and radio programmes including The One Show and The Andrew Marr Show promoting the drama A Poet In New York. The drama was also reviewed by National Poet of Wales Gillian Clarke for Radio 4 Front Row, and President Jimmy Carter was interviewed about his love of Dylan Thomas by Radio Wales. Lots more Dylan related coverage in the national press including a nice touch from The Guardian who included characters from Under Milk Wood as answers to their April 25th crossword. 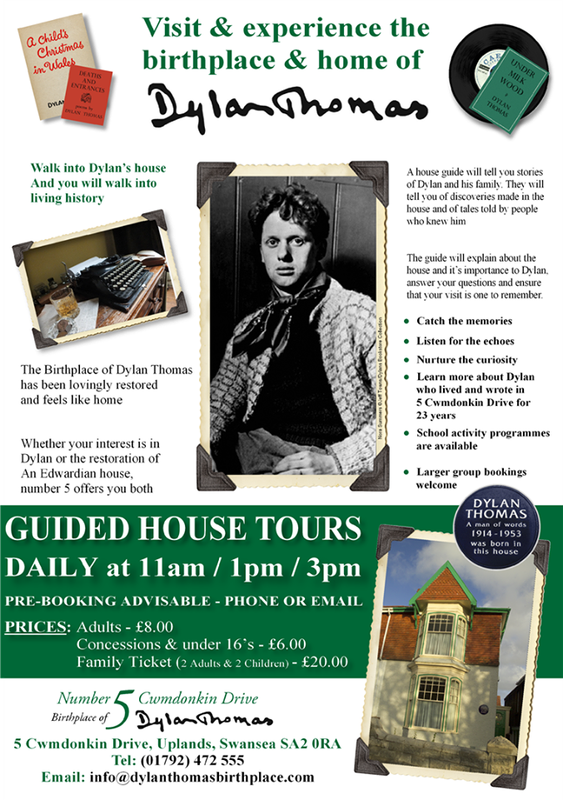 The Telegraph continue to run their Dylan Thomas Centenary Series (in association with Visit Wales) with a range of travel and arts related features including interviews with Michael Sheen, Hannah Ellis, Hilly Janes, and Gillian Clarke. Hannah Ellis also gave a Thomas family guide to her grandfather’s work to The Carmarthen Journal. A Poet in New York writer Andrew Davies gave an interview about the creation of the drama to the Daily Mail and Griff Rhys Jones had a piece on the same theme for the Radio Times. Actor Ewen Bremner who plays John Malcolm Brinnin in the forthcoming Set Fire To The Stars spoke to the Herald Scotland about the film, as did film producer A J Riach who spoke to The Northern Echo. London Origin of Under Milk Wood? Writer and manager of Browns Hotel Laugharne, Jon Tregenna, has developed a theory that Milkwood Road in Herne Hill, London, might be the inspiration for the naming of Dylan’s play for voices. Dylan is known to have frequented the Half Moon Hotel which stands opposite Milkwood Road, and is reported to have at one time lived in Milkwood Road. A selection of rare Dylan Thomas material is to be sold on behalf of the Trustees for the Copyrights of Dylan Thomas at Bonhams, London, on June 18th. Manuscript items and letters are to be offered including a typescript of Dylan’s final broadcast A Visit To America and his last known letter, written to Laugharne’s Portreeve. 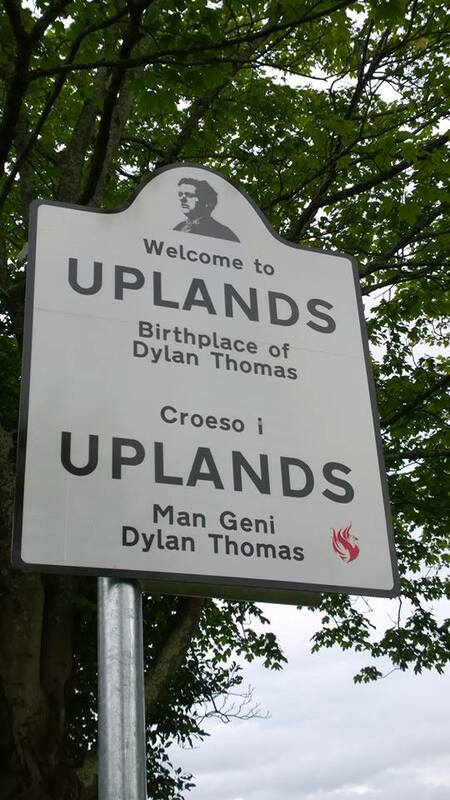 New signs reading “Welcome to Uplands – Birthplace of Dylan Thomas” and featuring a portrait of Dylan have been installed in Uplands, Swansea. The Queen’s Baton Relay celebrating the forthcoming Commonwealth Games visited Laugharne where Stella actor Julian Lewis Jones recited Dylan’s Being But Men and a flash mob mixed in with the spectators recited Do Not Go Gentle Into That Good Night. Sir Peter Blake has included a photograph of Dylan Thomas in the mural he has created for the Royal Albert Hall. The specially commissioned artwork includes portraits of 400 artists that have appeared at the venue since it opened in 1871. Dylan recited Edith Sitwell’s The Shadow of Cain at the venue in January 1953 as part of the Winter Proms series. 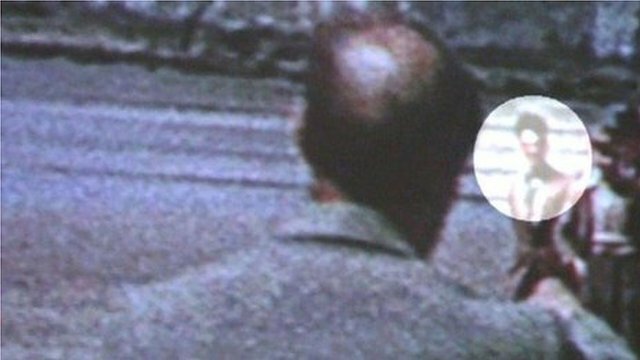 The performance was broadcast by the BBC. 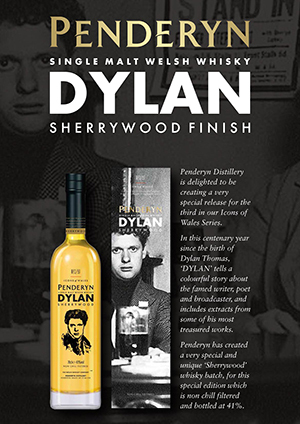 Welsh whisky distillery Penderyn have introduced a new single malt to their Icons of Wales range in honour of the centenary of Dylan Thomas. Cheers!